The third surviving child of Simon and Rose (Mansbach) Schoenthal was their son Louis. Atlantic City directory 1904 Ancestry.com. U.S. City Directories, 1822-1995 [database on-line]. Provo, UT, USA: Ancestry.com Operations, Inc., 2011. 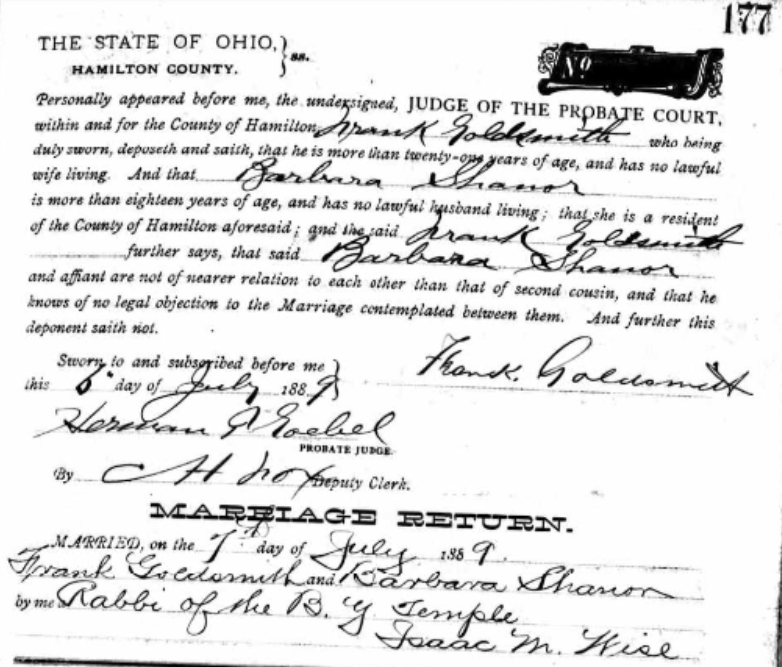 Louis married Mary Pomroy Dumbleton on October 27, 1906, in the First Methodist Episcopal Church in Camden, New Jersey. Mary, who was fourteen years older than Louis, was a Pennsylvania native whose parents were Andrew J. Pomeroy, a Pennsylvania native and a Civil War veteran who had once worked as a painter, and Adelaide Mann. Mary’s father had been disabled after the war and was living in a soldier’s home in Wisconsin from 1877 until he died on March 10, 1912. Her mother, also a Pennsylvania native, died in 1875 when Mary was only eleven years old. 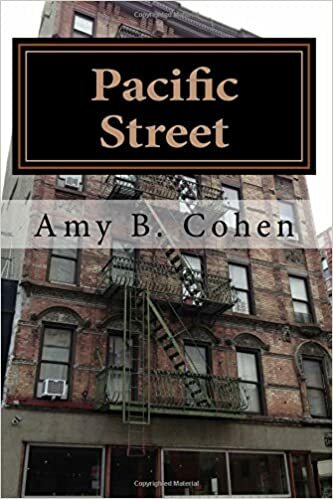 Although her two younger sisters were living with their grandparents in 1880, Mary, who was sixteen, was working in a hosiery mill in Philadelphia, living as a boarder in someone’s household. Mary married William Dumbleton on December 21, 1882, when she was nineteen. 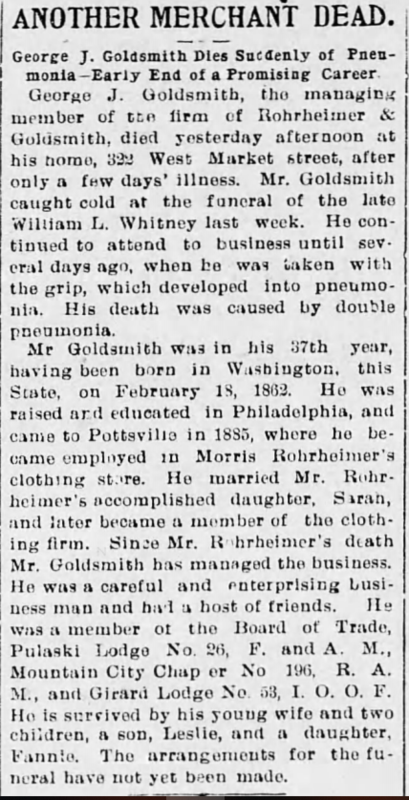 She was still married to him in 1900, living in Camden, New Jersey, but on December 18, 1900, her husband William died at age 38. What a sad life Mary had lived to that point. It sounds like something out of a novel by Charles Dickens. Her mother died, and her father lived in a soldier’s home in Wisconsin, and Mary ended up boarding with another family, working in a mill. She married at nineteen, only to become a widow when she was only 36 years old. She and William do not appear to have had any children. 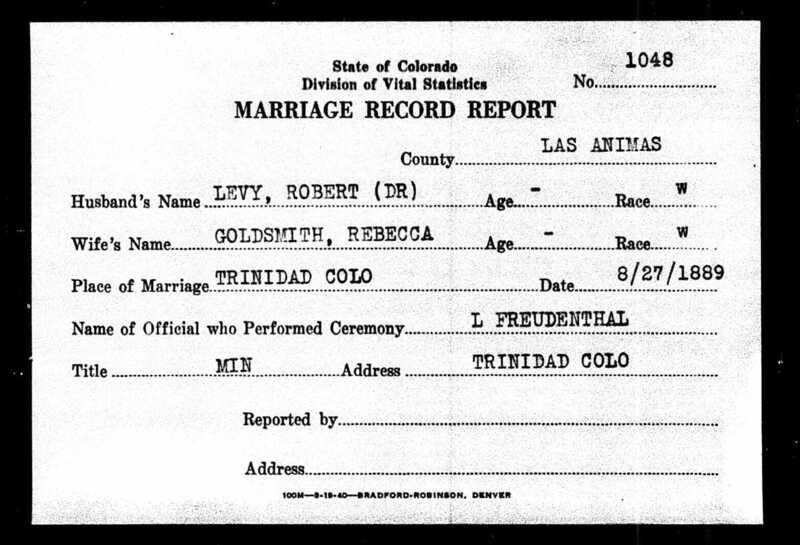 It was six years later that Mary married Louis Schoenthal. Eight policemen early this morning captured ten poker players in a gambling place on Atlantic avenue, near Delaware avenue, conducted, it is alleged, by Louis Schoenthal. He was held for the grand jury by Justice Williams. The players were so intent with the cards, a twenty-five cent limit game, that the officers had entered the room before they were seen. The players were held under nominal bail, as all were well known, although they registered under fictitious names. If he’d waited another seventy years or so, he’d have been able to play as much poker as he wanted in the casinos that now line the Boardwalk in Atlantic City. Or maybe even owned a casino. In 1909, Mary Schoenthal is listed without her husband in the Atlantic City directory for that year. Where was Louis? 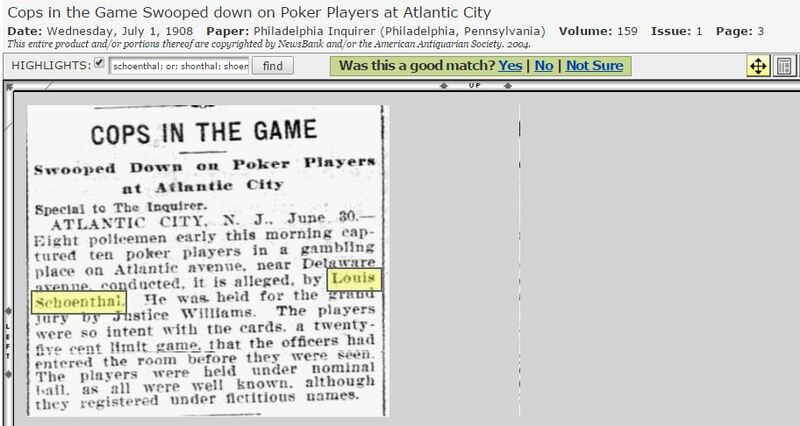 By 1910, Louis was far from Atlantic City and was one of the few children of Simon and Rose never to live again in the World’s Playground. Instead, he and Mary moved to California and were living in Los Angeles in 1910. 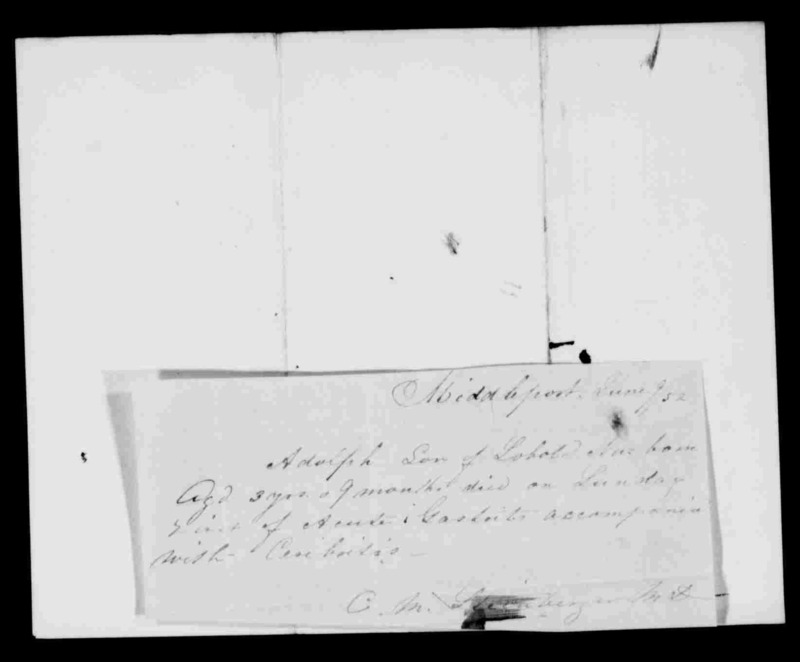 Although the census indexer listed his name as Morris and it certainly looks like it says Morris, I am quite certain that this was Louis and Mary Schoenthal, given the places of birth given for themselves and their parents as well as the occupation given for Louis/Morris. He was the proprietor of a stationery store, continuing in the business in which he’d been engaged in Atlantic City. What had driven them to California? Was it his arrest for gambling? Or the lure of California itself, which drew so many people in the early 20th century? Had he changed his name to Morris to hide from the Atlantic City police? After all, his poker players had played under fictitious names so this was a practice with which Louis was familiar. Is that why Mary was listed alone in 1909 in Atlantic City? Things got very confusing in 1914. Now there are listings for Louis N. Schoenthal, Morris L. Schoenthal, and Sidney R. Schoenthal, all residing at 930 ½ Santee. Morris is listed as the proprietor of Lou’s Place cigars, and both Louis and Sidney were working in that business as well, it would appear. So who were Morris and Sidney? Sidney is easy; he was the youngest child of Simon and Rose Schoenthal and the youngest brother of Louis. But Morris? My first thought was that Morris was Maurice Schoenthal, another younger brother, but Maurice (as well as the next brother, Martin) are both listed in the Chicago city directory for 1914, Maurice as a credit manager and Martin as a salesman, so Maurice could not have been the “Morris” listed in the Los Angeles directory for that. 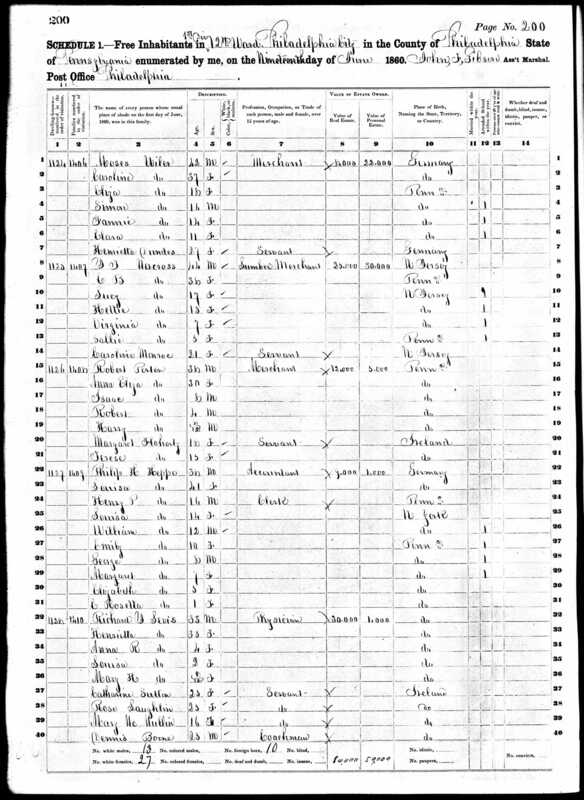 1917 directory for Los Angeles Ancestry.com. 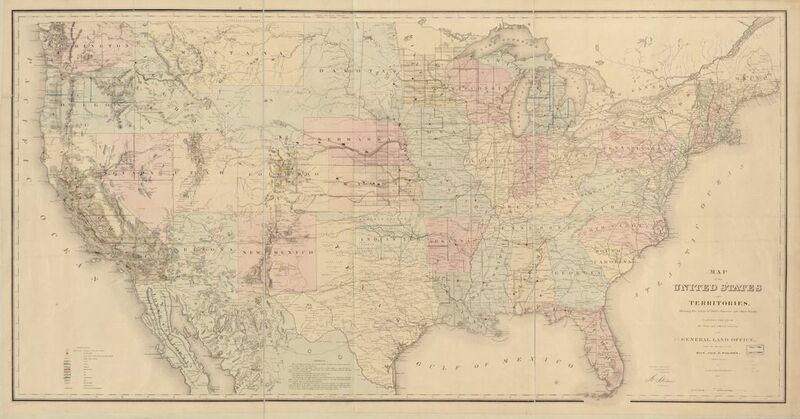 U.S. City Directories, 1822-1995 [database on-line]. Provo, UT, USA: Ancestry.com Operations, Inc., 2011. What happened to Morris? (Sidney is gone also.) The 1918 directory has no listings for Morris or for Louis, but does have one for Sidney. What was going on? Here Louis is Louis Maurice Schoenthal, not Louis Mansbach Schoenthal, so he does seem to have altered his name a bit. He is listed as married to Mary D. Schoenthal, residing at 480 Pine Street in San Francisco, working as a self-employed salesman in San Francisco. So as of 1918, Louis and Mary had left Los Angeles for San Francisco. 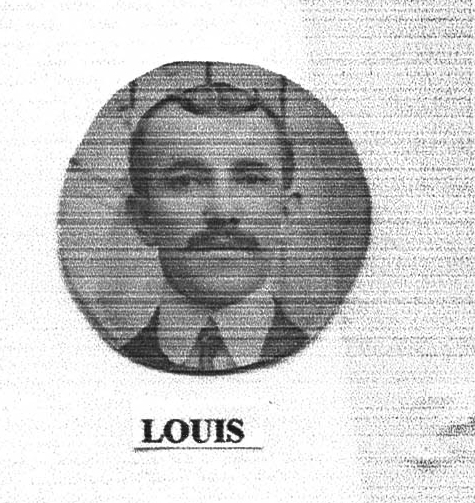 On the 1920 census, Louis is listed as Lou living as a lodger in San Francisco, working as a clerk in a dry goods store. Listed below him is Adel Schoenthal. Was this Mary? Or a new wife? Mary’s mother was Adelaide, and she had a younger sister by the same name. Was Mary now using an alias of some sort? Sheesh, these people are confusing! 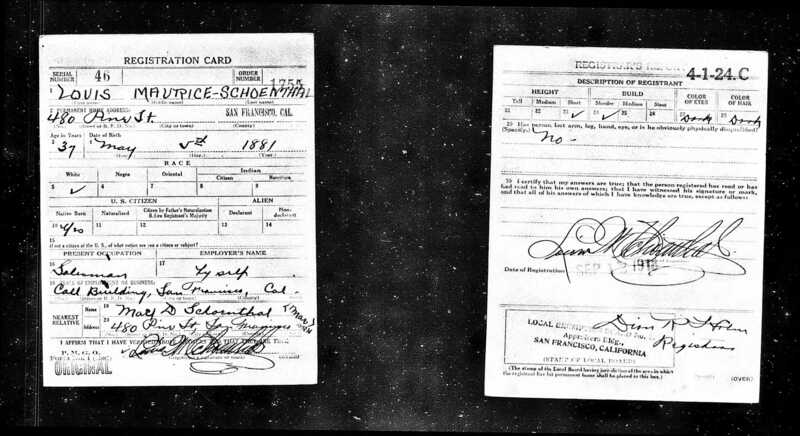 The 1923 San Francisco directory has a listing for Louie M. Schoenthal, a salesman, at 480 Pine Street. By 1928 he had moved to 1124 O’Farrell Street and was a salesman for the Superfine Candy Company. In 1929, living at the same address, his occupation was abbreviated as “confr mfr.” Confectioner manufacturer? Unfortunately, Louis is not listed in the 1930, 1931, 1932, or the 1933 San Francisco directory, nor can I find him on the 1930 US census. I have no idea where he might have disappeared to during those years. In 1934, he resurfaces in San Francisco, however, living with Mary at 954 Eddy Street and working as a laborer. In 1935 he is listed as Louis Schoental, living at 844 California, with no mention of Mary in the listing. On the 1940 census, Louis was living in a hotel, alone, giving his marital status as single and his work status as retired. He was 62 years old. I cannot find any records for Mary after the 1934 directory listing. I don’t know if they had divorced or she had died between 1934 and 1940. He did not list himself as either divorced or widowed, so I cannot tell. 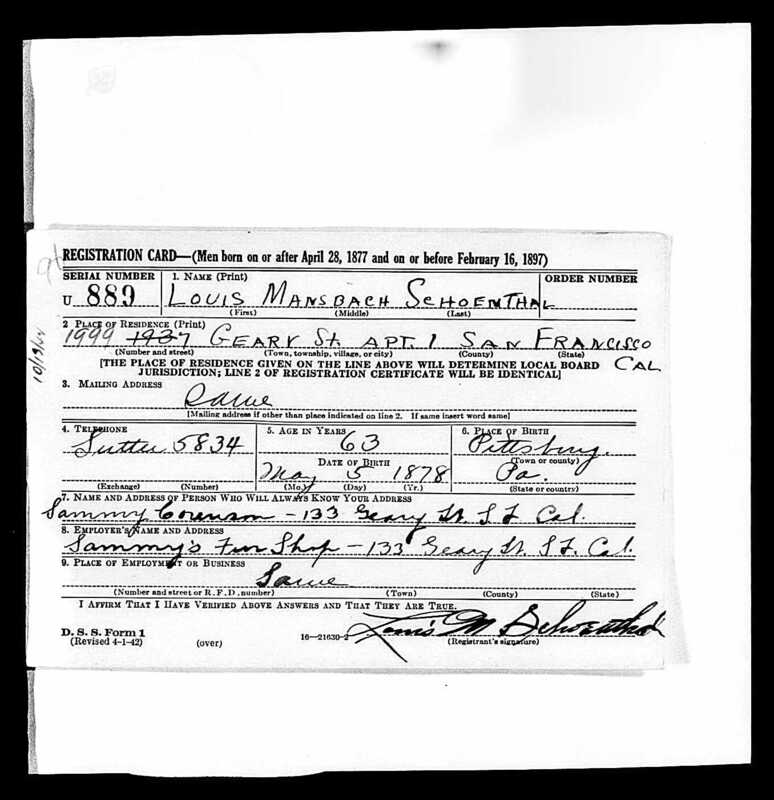 When Louis registered for the “old man’s draft” in 1942, he gave his name as Louis Mansbach Schoenthal this time. He was still living in San Francisco, working at Sammy’s Fur Shop. He provided Sammy’s name and address as the person who would always know his address. The only other information I found about Louis only added more confusion. It seems that in the summer of 1946, Louis had a stroke that landed him in the hospital (Laguna Honda) for an extended time. I only know this because of three mentions of his hospital stay in Billboard under the caption Showfolks of America. Apparently, Louis became or had been a showfolk or a showman. Billboard, August 24, 1946, p. 73; September 7, 1946, p. 74; September 21, 1946, p. 69 (all found through Google Books). What, you might ask (as I did), does that mean? I can’t really find a definitive explanation, but from what I did find both in these articles and the sections of Billboard where they appeared (under “Carnivals”) as well as in other sources, I believe that showfolk or showmen were the people who set up booths as vendors at outdoor carnivals or who performed at those outdoor venues. Maybe when Louis was a candy salesman and/or manufacturer he had been working the carnival trade? Is that why he disappeared between 1929 and 1934—was he traveling with the carnival? I wish I knew. According to the California Death Index, Louis Schoenthal died on June 26, 1956, in Napa, California. He was 78 years old. 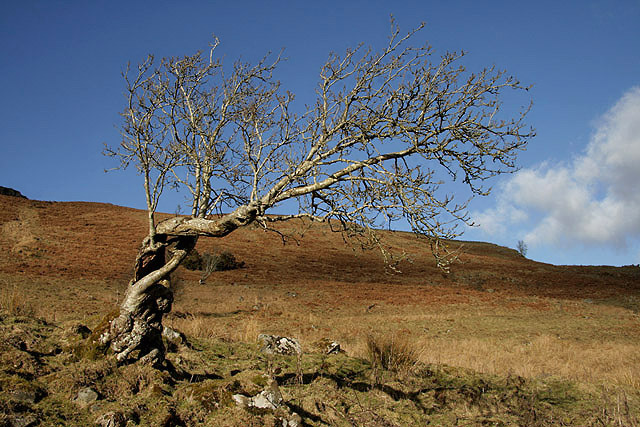 He died far away from all of his siblings; he was no longer married to Mary Dumbleton, and he had no children. I wish I could have found out more about Louis. There are so many questions left unanswered, and given that he has no direct descendants and lived so far from his family, I am not sure I will ever find the answers. As I wrote in my last post about the Nusbaums, the 1850s were for the most part a decade of growth for the Nusbaum and Dreyfuss families although there were two tragedies during that decade. 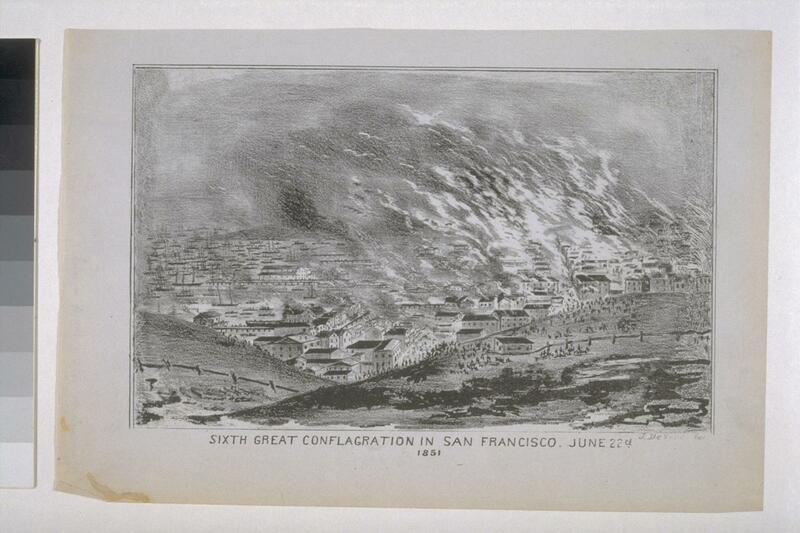 I have already written about the tragic death of Maxwell Nusbaum in the 1851 Great Fire in San Francisco. Maxwell died trying to protect the property of another merchant, and his death left his wife Mathilde Dreyfuss Nusbaum with two very young children, Flora and Albert. Mathilde remarried a few years later, marrying Moses Pollock, with whom she had two more children in 1856 and 1859, Emanuel and Miriam. 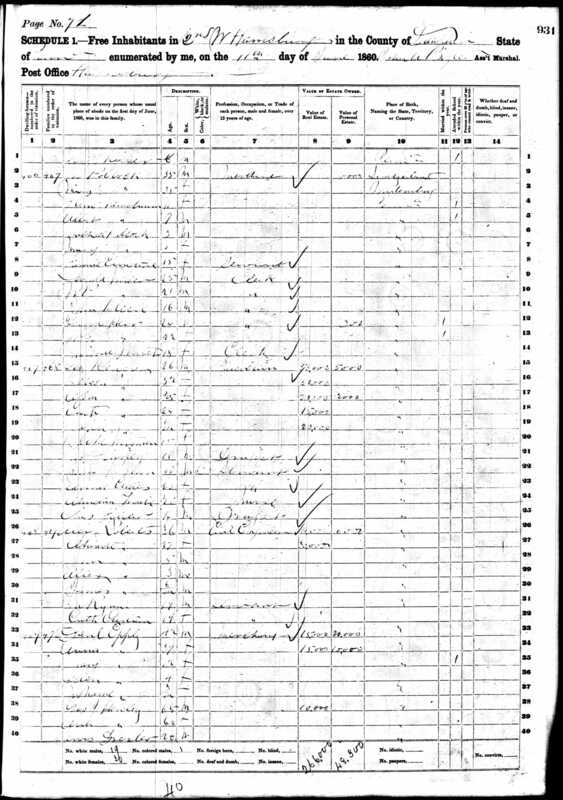 Moses was employed as a merchant in Harrisburg, according to the 1860 census. Since Mathilde was my three-times great-grandmother Jeanette’s sister, her children with Maxwell were cousins both maternally and paternally. 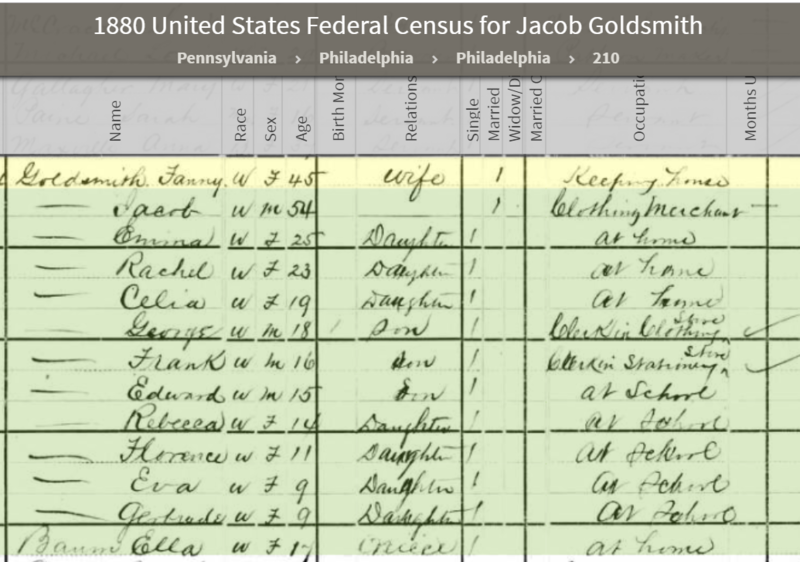 In the 1850s a number of the Nusbaum/Dreyfuss siblings were living in Harrisburg, Pennsylvania. 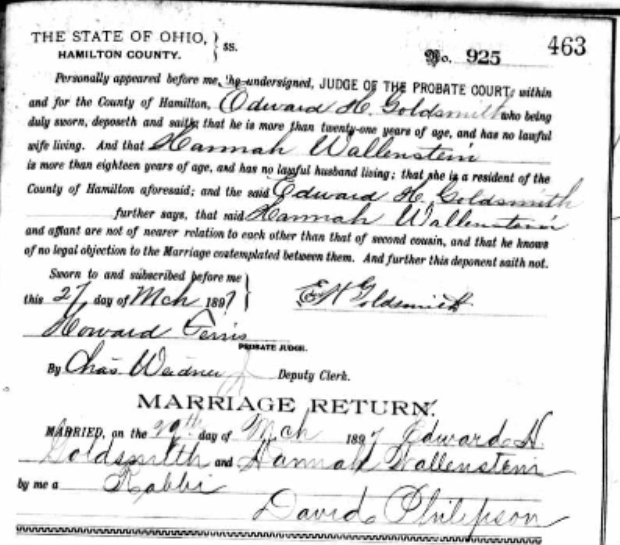 In 1860, Mathilde Nusbaum (sister of Maxwell, John, Leopold and Ernst) and her husband Isaac Dinkelspiel were still living in Harrisburg with their three children, now all adolescents: Paulina (19), Adolph (17), and Sophie (12). Isaac was working as an “agent,” which I assume means he was an agent in the Nusbaum merchant business. His son Adolph was working as a clerk, again presumably for the Nusbaum family business. Mathilde Nusbaum Dinkelspiel’s brother Leopold Nusbaum had also moved to Harrisburg during the 1850s, leaving Blythe, Pennsylvania where he had been a butcher. Perhaps they moved in the aftermath of his family’s personal tragedy. Their son Adolph, born in 1848, died on June 6, 1852. He was only four years old. He died from acute gastritis. The death certificate says it was “accompanied by” a word I cannot decipher. Can anyone read it? He was buried at Mikveh Israel cemetery in Philadelphia. I found it interesting that the family, though living in Harrisburg, buried their child in Philadelphia. Perhaps the Jewish cemetery in Harrisburg had not yet opened. UPDATE: My medical consultant says that the other cause of death is cerebritis, meaning a brain infection or abscess. Leopold and his wife Rosa had a second child, Francis, who was born in 1850. Although Francis is listed as a boy on both the 1850 census and the 1860 census, by 1870 she is identified as female and is so thereafter. Her name, however, is almost always spelled as Francis, and I suppose that must have confused the first two census takers as ordinarily Francis is a boy’s name and Frances is the way it is spelled for a girl. At any rate, it is pretty clear that Francis was a girl even in 1850 and 1860. Leopold seems to have given up on being a butcher when he moved to Harrisburg. 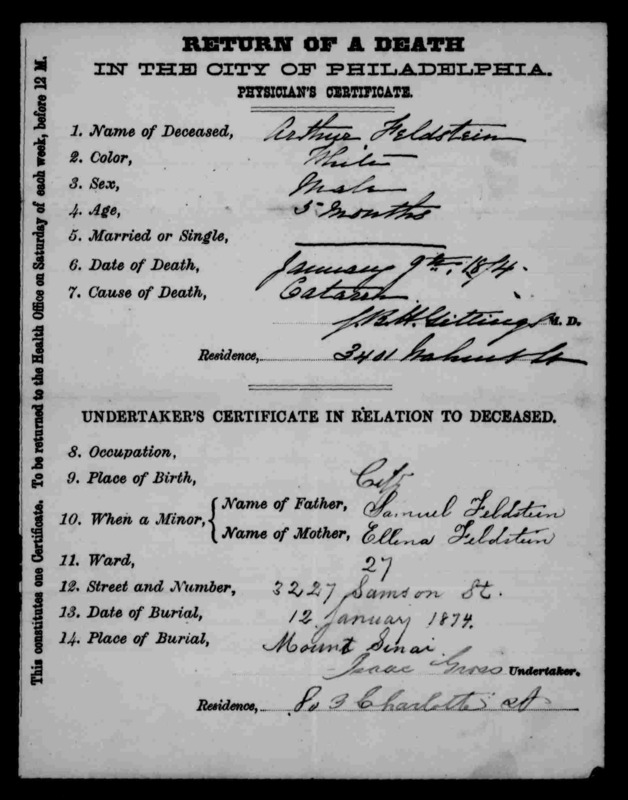 According to the 1860 census, he, like his brothers John and Ernest, was now a merchant. 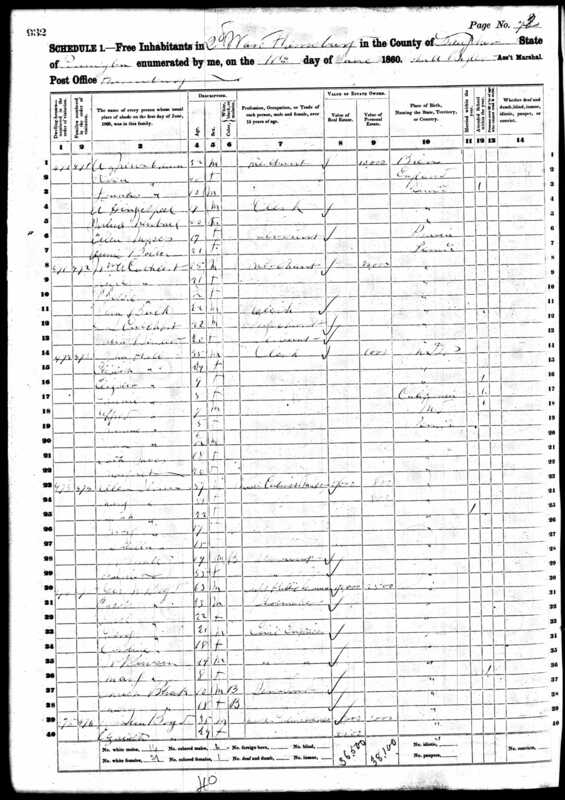 Also listed as living with Leopold, Rosa, and Francis on the 1860 census was “A. Dinkelspiel,” presumably Adolph Dinkelspiel, Leopold’s nephew, Mathilde’s son. 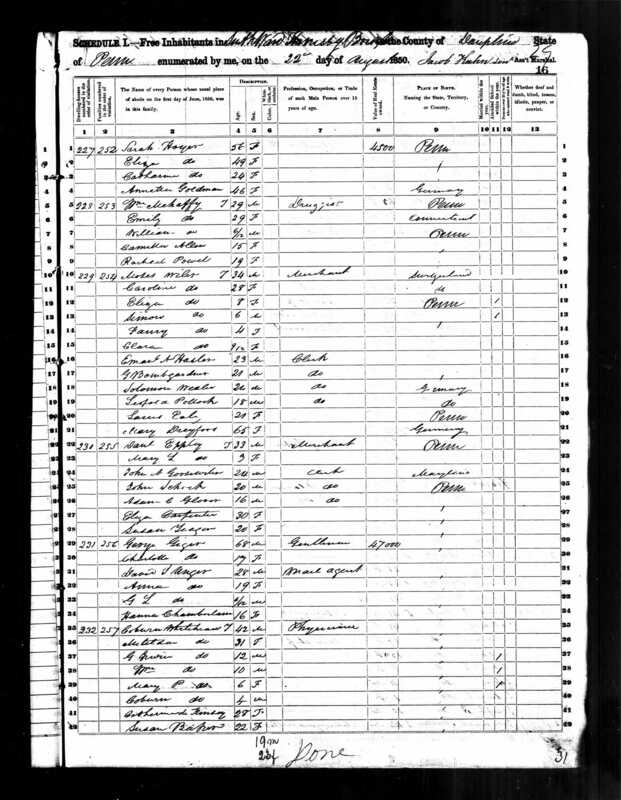 Since Adolph was also listed in his parents’ household, my guess is that he may have been living with Leopold and working as a clerk in his store, but that his parents had also counted him as part of their household. In addition to the two Nusbaum siblings Leopold and Mathilde (Dinkelspiel), Harrisburg was also the home of Caroline Dreyfuss Wiler for some part of the 1850s. Caroline, the sister of Jeanette Dreyfuss Nusbaum and Mathilde Dreyfuss Nusbaum Pollock, was married to Moses Wiler. They had four children, Eliza (1842), Simon (1843), Fanny (1846), and Clara (1849). Simon was born in Philadelphia, and Clara was born in Gettysburg (nothing more specific than Pennsylvania is given for Eliza or Fanny), so Caroline and Moses must have been moving around quite a bit within Pennsylvania during the 1840s. I assume he was a peddler and thus the family kept moving until he could open a more permanent business. 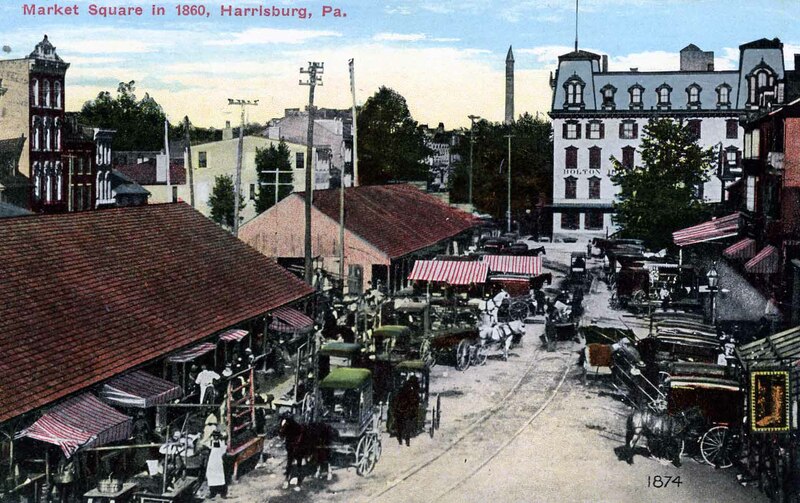 Although they are listed as living in Harrisburg in 1850, by 1860 they were living in Philadelphia with their four children, at that point three teenagers and one eleven year old. Moses was working as a merchant, apparently doing quite well. He had $8000 worth of real estate and $22,000 worth of personal assets; they also had a 27 year old servant living with them. 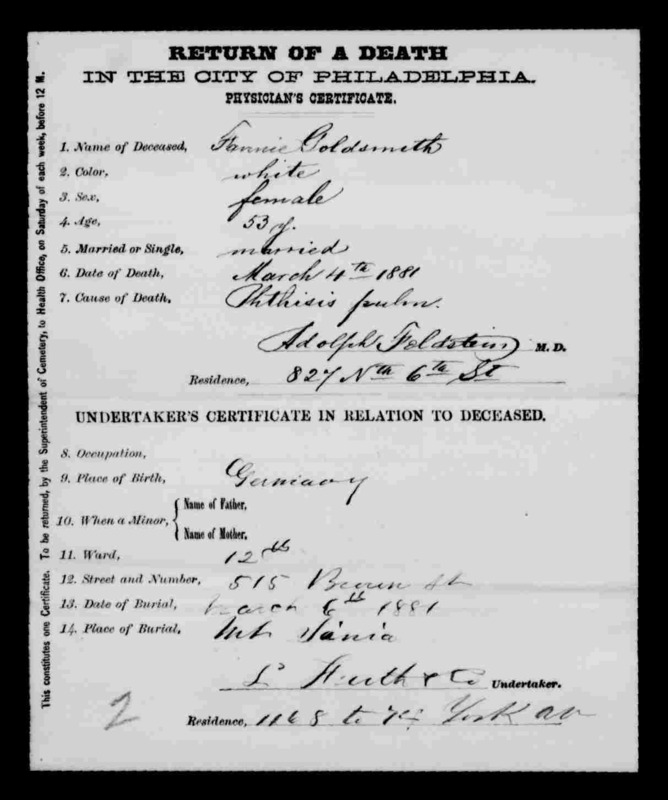 John Nusbaum, my three-times great-grandfather, had also moved to Philadelphia by 1860. 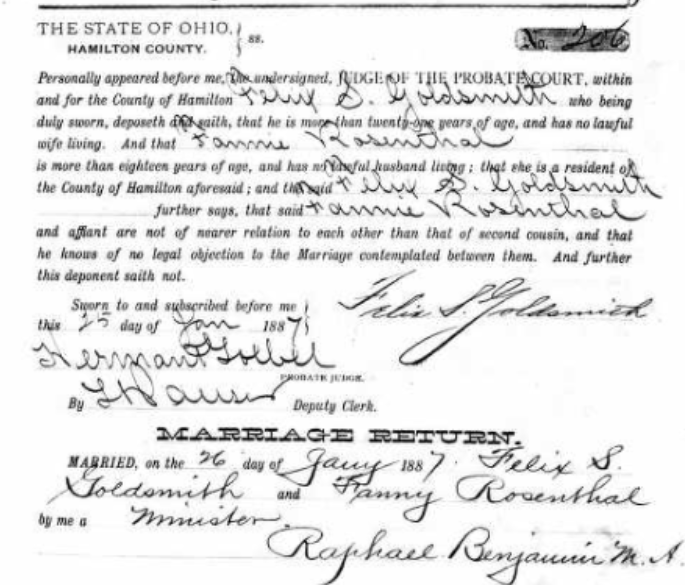 In fact, their fifth child, Miriam, was born in Philadelphia on October 30, 1858, so the family must have relocated from Harrisburg by that time. According to the 1859 Philadelphia directory, John Nusbaum and his family were living at 433 Vine Street, and his place of business was located nearby at 132 North Third Street in Philadelphia. John and Jeanette and all five of their children were living, like the Wilers, in the 12th Ward of Philadelphia. John was occupied as a merchant and had $6000 in real estate and $20,000 in personal property, so like his brother-in-law Moses Wiler, he was doing quite well. In fact, the Nusbaums had two servants living with them at that time. My great-great-grandmother Frances, the future wife of Bernard Seligman, was fourteen years old in 1860, and her brothers were 12, 17, and 18, plus there was two year old Miriam, so it must have been quite a handful for those two servants—four adolescents and a toddler. John and Jeanette not only had Jeanette’s sister Caroline and her family living nearby, they also had John’s brother Ernst and his family living about a mile away. According to the 1859 Philadelphia directory (see above), Ernst Nusbaum was living at 521 Buttonwood and working at 55 North Third Street, down the block from his brother John. 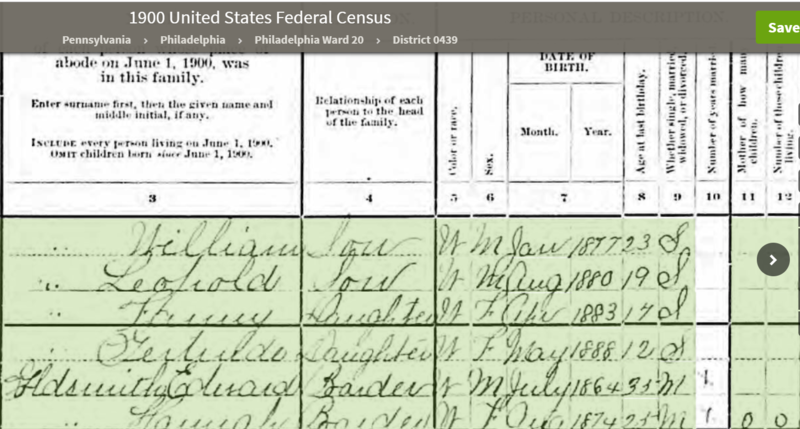 Ernst had been living in Philadelphia since at least 1851 since his first child Arthur was born on December 31 of that year. In 1852, he and his wife Clarissa Arnold and their infant son were living at 191 North 10th Street, and Ernst was working as a merchant at 70 ½ North Third Street. By 1854 they had moved to Buttonwood Street, and in the 1859 directory Ernst is listed as a clothier doing business with Simon W. Arnold (Clarissa’s brother) and Jacob Nirdlinger. 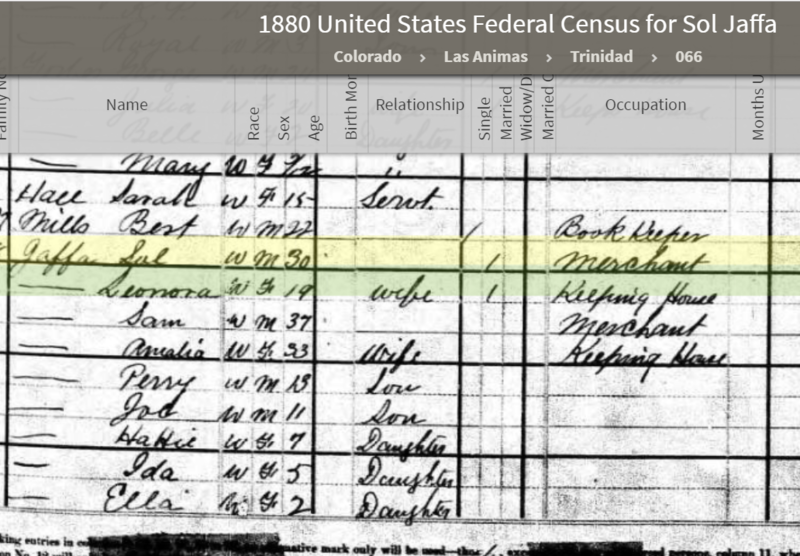 On the 1860 census, Ernst’s occupation is listed as “M’s Tailor,” or what I assume is men’s tailor. Was that his role in the clothing business with his brother-in-law Simon? Or was it more that they were selling men’s clothing? Ernst had $20,000 in personal assets and two servants living in the home in addition to his wife Clara and their five children: Arthur (1851), Myer (1852), Fanny (1856), Edgar (1858), and Henrietta (1860 and just two months old at the time of the census). Unlike his brother John, Ernst had a household of young children in 1860, five children under ten years old. Thus, whether in Harrisburg or Philadelphia, the Dreyfuss sisters and their husbands and the Nusbaum siblings and their spouses were all adjusting to life in America, and their families were growing. Although they suffered two very tragic losses early in the decade of the 1850s, by 1860 it appears that all were doing well. The next decade would bring changes as the next generation entered adulthood and the country faced the Civil War. I am awaiting a book on the Jewish history of Harrisburg and should know more once it arrives. Thus, my reference to two sons in my prior post was mistaken. The Nusbaum businesses were located about a mile north of where my Cohen relatives were operating their pawnshop business during this same time period. 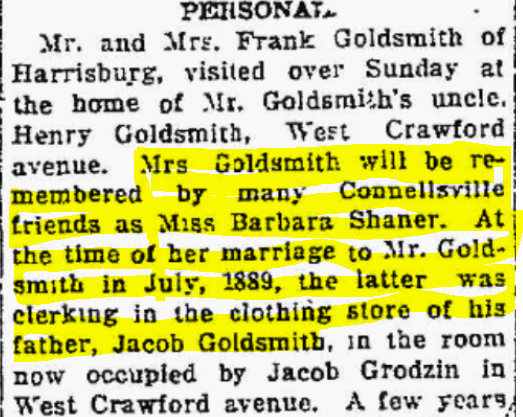 It would be interesting to know how often their paths crossed even before Flora Cohen married Jacob Weil in 1908. The ten year gap between Julius and Miriam makes me wonder whether there weren’t other children born during that time who did not survive. By 1850, as I wrote previously, John Nusbaum and his siblings Mathilde, Leopold, Ernst, and Maxwell were all settled somewhere in Pennsylvania and involved in selling merchandise (except for Leopold, who was a butcher). In the next decade the family would move around a bit, see their families grow, and endure some terrible tragedies. The first of those tragedies involved Maxwell. 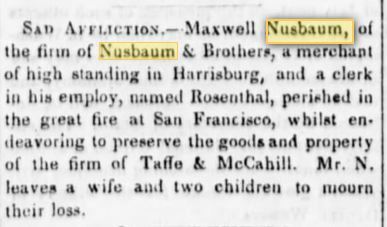 In 1850 Maxwell was living in Lewistown, working as a merchant in a store that carried his name, M. Nusbaum’s. He and his wife, Mathilde nee Dreyfuss, the sister of my three-times great-grandmother Jeanette Dreyfuss Nusbaum, had a daughter Flora who was born in 1848. And Mathilde must have been pregnant in 1850 because on January 30, 1851, their son Albert was born. Maxwell and Mathilde must have moved to Harrisburg by then because Albert’s birth took place in Harrisburg. 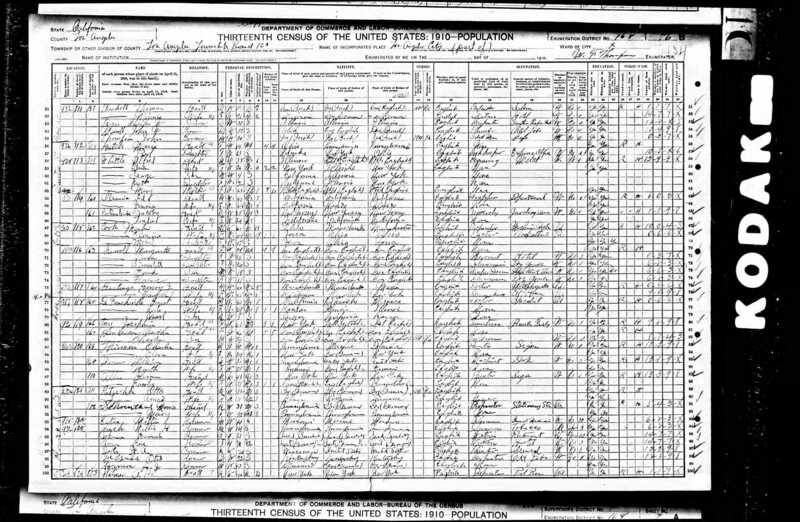 When I searched for Maxwell and his family on the 1860 census, I could not find Maxwell or Mathilde at all, but I did find Albert and Flora Newsbaum, living with an M. Pollock, a Swiss born merchant in Harrisburg. 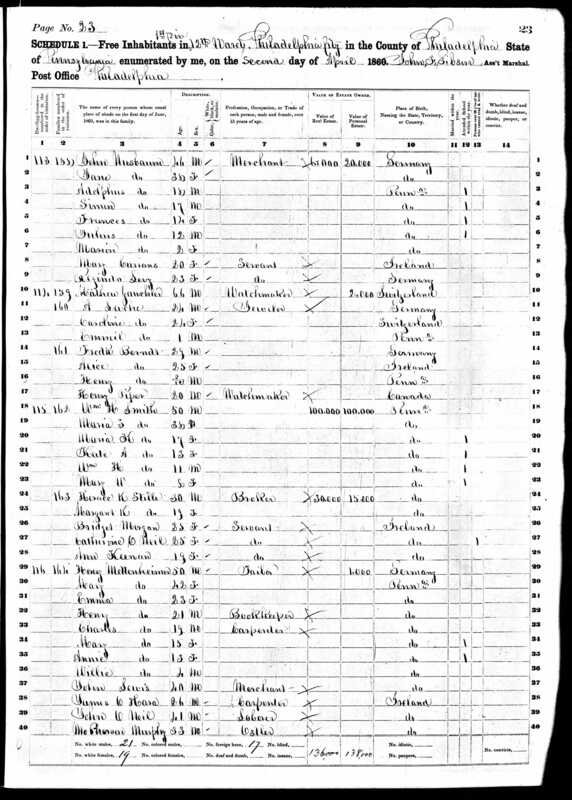 Unfortunately, the census was barely legible, and the transcriber had had a lot of difficulty recording the names on the census, but by searching generally for M. Pollock born in Switzerland and living in Harrisburg, I was eventually able to find out that M. Pollock was Moses Pollock and that he was married to Mathilde. 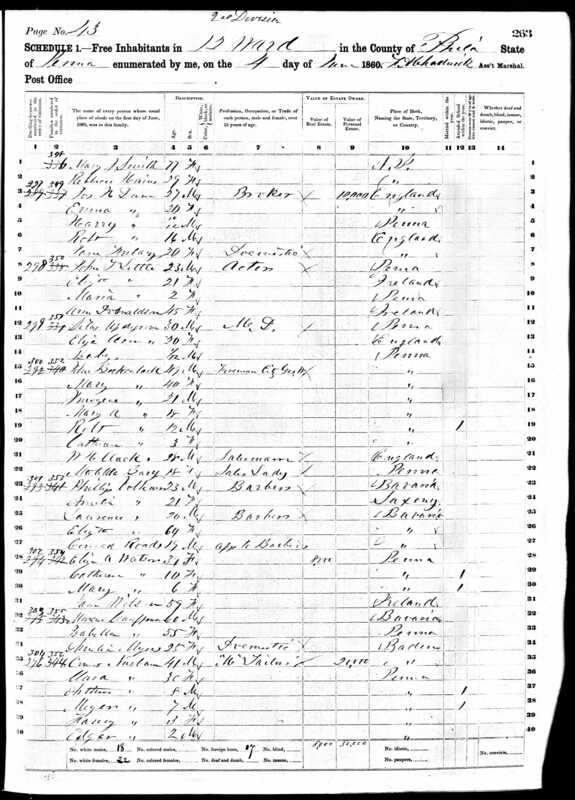 The other names on that 1860 census, although transcribed as Mary Pollock, Michael Pollock, and Mary Pollock, were really Mathilde, Emanuel, and Miriam Pollock. Emanuel and Miriam were Mathilde’s children with Moses, born in 1856 and 1859 respectively. 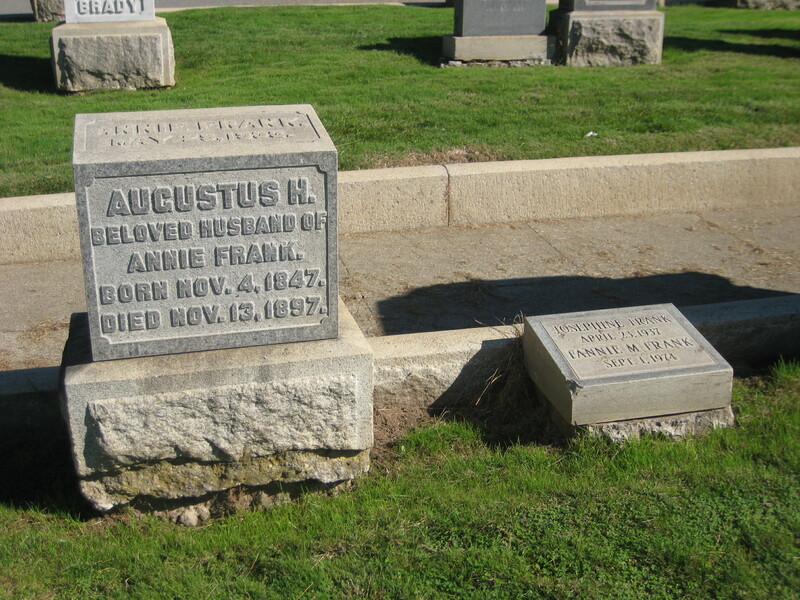 Maxwell had died in San Francisco while trying to protect the property of another business from the raging fires that destroyed much of San Francisco in the spring and summer of 1851. The great fire on this day actually began after 11:00 PM on May 3rd, in a store on the south side of Portsmouth Plaza. A known habitue of villainous Sydney-Town was seen running from the store moments before it exploded in flame and simultaneous fires erupted in the business district. 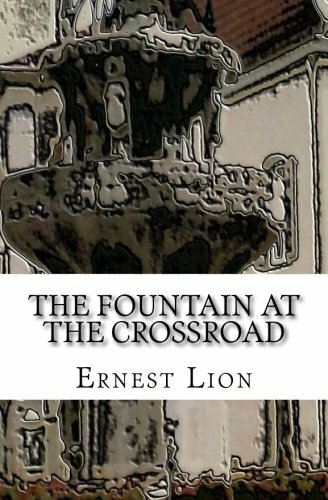 Water evaporated to steam as swift winds sent the roaring flames everywhere through the great blow-pipe-like hollows beneath the plank streets. Men in their anguish, ran for shelter within new, fancied “fireproof” brick and iron buildings, only to perish miserably when the metal shutters and doors expanded and couldn’t be opened. Three-fourths of the city was lost, yet, in ten days, San Franciscans rebuilt one-fifth of their city. On June 22, 1851, just before 11:00 AM, a fire, clearly the work of an incendiary, broke out in a frame house on Pacific Street near Powell. Strong summer sea-breezes drove the flames south and east. Firefighter’s fearless battles were of no avail against the fire’s intense heat and speed. Ten blocks and portions of six others were destroyed between Powell, Sansome, Clay and Broadway. The raging demon swept away relics of an older time. 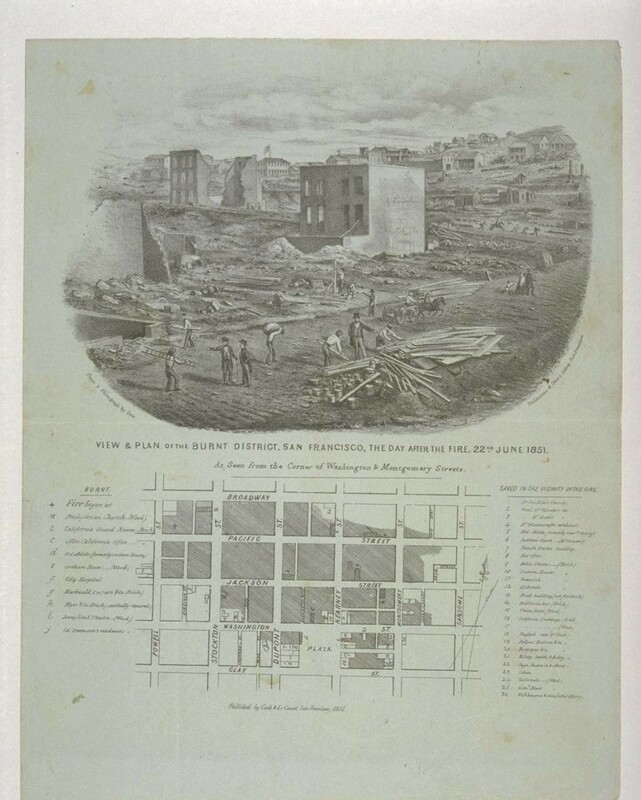 City Hall was consumed, born in 1846, and the Jenny Lind Theatre burned for the sixth time. The Old Adobe Custom House burned, and Sam Brannan’s House, in which were exhibited the first specimens of gold brought from the Placers, met the same fate. San Franciscans quickly rebuilt again, this time, with water tanks on many roofs. For some reason, neither of these reports indicates how many people were killed in the fire, nor have I yet found any other source that reveals that information. I have to believe that there were many people killed in addition to my third great-grand uncle Maxwell Nusbaum and his clerk Rosenthal. I was surprised to learn that Maxwell was all the way in San Francisco, presumably for business. 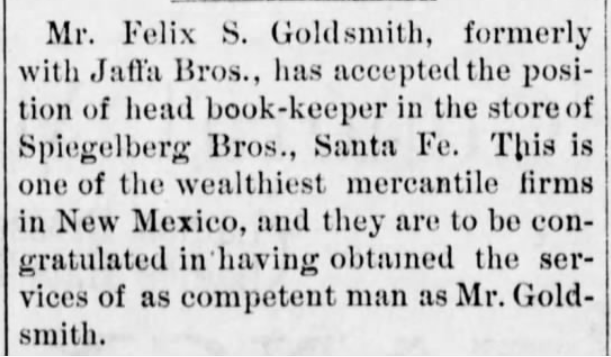 Was he transporting merchandise to this other merchant in San Francisco? How did he get all the way there? His wife was home with a three year old daughter and a five month old son. How long would he have been away? How long did it take in 1851 for the news to get back to Mathilde that her husband had died in the fire? Unfortunately, I cannot find the answers to these questions, but I can imagine how dreadful it must have been for her, a relatively recent immigrant with two very young children, losing her husband. Also living in Caroline and Moses Wiler’s household, in addition to Mary Dreyfuss and the Wiler’s four children, Eliza (1842), Simon (1843), Fanny (1846), and Clara (1850), was an eighteen year old man named Leopold Pollock, reportedly born in Germany, according to the 1850 census. I do not know what his connection to the household was, but further research revealed that he, like Moses Pollock, was born in Switzerland, not Germany. My hunch is that Leopold and Moses Pollock were brothers. Moses Wiler, who was about ten to fifteen years older than the two Pollocks and also born in Switzerland, was probably either a relative or friend from back in Switzerland. The Pollock brothers likely came to Harrisburg in order to be near Moses Wiler, and the Wilers had taken in the teenaged Leopold when he arrived. When Mathilde was suddenly a widow after Maxwell was killed in the 1851 fire, perhaps her sister Caroline introduced her to Moses Pollock. Mathilde and Moses must have been married within a few years after Maxwell’s death, given that their first child Emanuel was born in 1856. 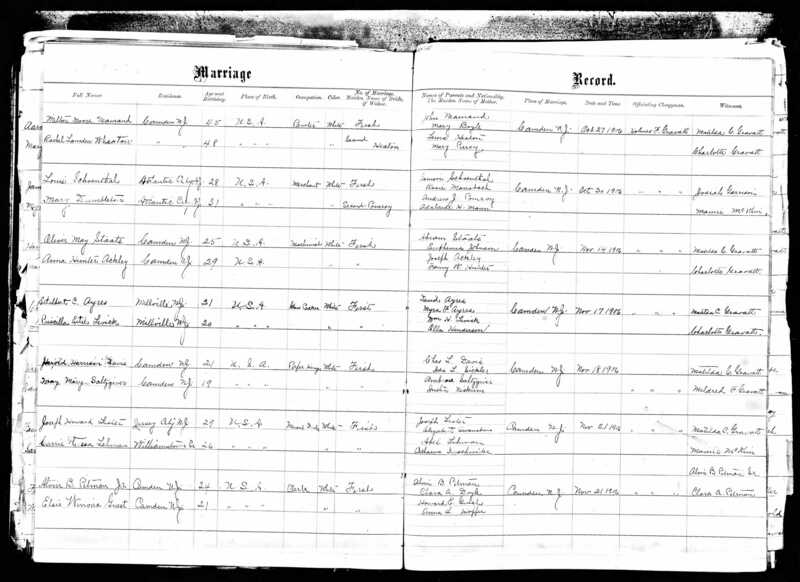 I cannot locate Moses Pollock on the 1850 census, so perhaps he arrived after his brother Leopold and then soon thereafter married Mathilde. These relationships get rather unwieldy since two branches of my family are entwined. Jeannette Dreyfuss was my three-times great-grandmother, making her two sisters Mathilde and Caroline, my three-times great-grand aunts (or four-times great-aunt, as some prefer). Since Mathilde married Maxwell, who was the brother of my three-times great-grandfather, that means that my three-times great-grand aunt married my three-times great-grand uncle. That makes their children, Flora Nusbaum and Albert Nusbaum, my first cousins four times removed both on the Nusbaum side through Maxwell and on the Dreyfuss side through Mathilde. And so on through their descendants. And then it gets even more twisted a generation later when Flora Nusbaum, my double first cousin four times removed, married Samuel Simon. Samuel Simon had a brother named Moses Simon. Moses Simon married Paulina Dinkelspiel, who was the daughter of Mathilde Nusbaum Dinkelspiel, another of my three-times great-grand aunts, another sister of John Nusbaum. So Flora and Paulina were both first cousins (since Maxwell Nusbaum and Mathilde Nusbaum Dinkelspiel were siblings) and sisters-in-law. And, of course, the children that Mathilde Dreyfuss had with Moses Pollock and the children that Caroline Dreyfuss had with Moses Wiler are also my first cousins four times removed, but only on the Dreyfuss side. I know. It’s confusing. I’d make a chart, but would it help? It was a small and somewhat twisted world. No wonder they say DNA testing for Ashkenazi Jews is not terribly accurate. We are all cousins of each other of some kind or another.